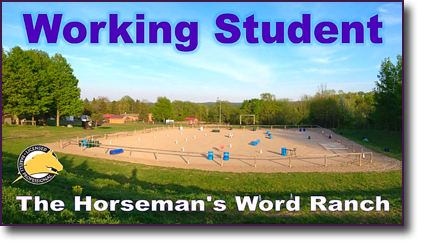 Immerse yourself in learning and come study with us at the Horseman’s Word Ranch in Uxbridge, Ontario. Students get a hands-on learning experience that focuses on horsemanship development, facility management and horse husbandry with Parelli Professionals. This opportunity is open to all individuals, who are currently studying the Parelli Program. A minimum 2 week commitment is required (with the possibility to stay beyond 2 weeks available. This is an option after you spend your first 2 weeks on the ranch). Starting options begin the week of May 6th, 2019 and run through the fall 2019. Your weeks on the ranch are flexible based on your availability so you let us know when you would like to be on the ranch. The only requirement is that you spend a minimum of 2 weeks on the ranch.